Maxforce FC Ant Bait Gel kills and controls a wide variety of household ants, including Argentine Ants, Odorous House Ants, Little Black Ants, Ghost Ants, Pavement Ants, and Cornfield Ants. Using Maxforce FC Ant Biat Gel, you will start to see fewer ants in 3-5 days. The bait works to not only kill the ants you see, but to ensure the entire colony is eliminated. Ants will carry the bait back to the nest and destroy the colony. Maxforce Ant Bait Gel provides for the sugar feeding needs of ants. We also highly recommended that a protein-based bait, such as Advance 375A Ant Granular Bait, be used in conjunction with the gel bait. You should always give ants a choice as they may be in the mood for either a protein (granule) or a sugar (gel) bait. Each box contains 4/ 27 gram tubes. We provide 1 Plunger PER ORDER to expel the bait from the tubes. You can purchase extra plungers or you can purchase a bait gun for use with this product. We recommend using the Masterline Professional Bait Gun. Maxforce Ant Killer Bait Gel with Fipronil takes advantage of the natural behavior of ants. Foraging worker ants are attracted to the sweet formula of the bait. After consuming the bait the foraging ants will return to the nest and share the bait with the rest of the colony, including the queen(s) in what is known as the Maxforce Domino Effect, effectively eliminating the colony. Maxforce Ant Killer Bait Gel offers a long term ant solution in a convenient easy to use application that begins to work in as little as six hours. The active ingredient in Maxforce FC Ant Bait Gel, Fipronil, is in the Phenylpyrazole family of insecticides and is used in many products when a delayed kill is desired, such as ant and roach baits. Fipronil disrupts the insect central nervous system, causing hyperexcitation of nerves and muscles. Maxforce FC Ant Bait Gel is tough on ants, yet gentle on people, pets, and the environment. Mammals do not have the nervous system channels that are most affected by fipronil in insects. The high moisture content of the bait also increases its attractiveness to target ants. Maxforce FC Ant Bait Gel can be used whenever listed ants are present and foraging for sweets. Bait is simple and convenient to use, and it is ideal in situations where sprays may not be desired. Maxforce FC Ant Bait Gel lets the ants take the product to the colony for you, avoiding the guessing game of finding a nest. Maxforce FC Ant Bait Gel is effective against Argentine, Odorous House, Ghost, Pavement, and Little Black Ants. Ants will carry the bait back to the nest and destroy the colony. You will see fewer ants in 3-5 days. 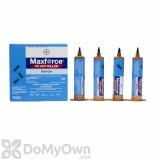 Maxforce Ant Gel provides for the sugar feeding needs of ants. If the ants are foraging for protein as well, it is recommended that a protein-based bait be used in conjunction with the gel bait. Place small pea-size amounts near areas where ants trail or forage, or where they are entering the structure. The gel can be applied in cracks and crevices, on pipes, behind appliances, along baseboards, etc. Can be used both inside and outside. Be careful of children and pets. DO NOT apply residual insecticides or sprays near baits as this will prevent ants from taking the bait. Reapply gel as needed. Always read the label. How do I apply Maxforce Ant Killer Bait Gel? Next, remove the cap and depress the plunger. If necessary, during the first few placements simply pull back slightly on the plunger to prevent over application. Small pea sized placements should be made near ant trails or near areas where ants have been observed to forage. Usually 3 placements will be sufficient for an average sized room with a light to moderate infestation, use more for larger areas or heavy infestations. Bait will remain effective for up to two weeks. Each 27g tube of Maxforce FC Ant Bait Gel will make approximately 27 bait placements. Each box of 4 tubes yields approximately 108 placements. Commercial, industrial and residential areas, including food and feed areas of food and feed handling establishments. See above for general application instructions. Apply bait directly into crack and crevices and where ants may travel, in areas such as between different elements of construction, openings leading into voids and hollow spaces, around plumbing pipes, cabinets, sinks, and stoves. Do not apply bait to areas where food or utensils may become contaminated or areas that are routinely washed, such as food preparation surfaces. Do not apply in areas where temperatures exceed 120 degrees F as bait may run. Place gel outdoors into, on or adjacent to structures where you see ants, next to ant trails and suspected areas of ant activity. Likely locations for ants and gel placements are points of entry into structure and areas with potential water damage including: eaves, soffits, weep holes, where wires and pipes come into the building structure, trees, stumps, roots, wood decks, fences, planter boxes, woodpiles, landscaping, and railroad ties. Extreme heat or cold, direct sunlight and water may reduce the residual effectiveness. Apply Gel outdoors into bait stations such as Ant Café Refillable Bait Stations to protect bait from dust, rain, and sunlight. Inspect placements and reapply as needed. The gel will remain attractive to ants for up to two weeks. Inspect gel placements and reapply as needed. Reapply in the same area if bait is gone or in a different location if no ant activity is evident. You will notice fewer ants in days. High moisture content makes bait more attractive. Formulation is highly attractive to sweet-feeding ants. Labeled for a wide variety of household ants. Bait is easy and convenient to apply with enclosed plunger or a bait gun. Bait remaining in an opened tube is viable for up to one year if stored properly. Pet safe when used as directed. Extremely low toxicity to people and pets. Store out of direct sunlight and extreme temperatures. When exposed to higher temperatures (above 80 degrees F) for extended periods of time, the gel will change color and lose effectiveness. It is more effective to use smaller, more frequent bait placements, rather than large chunks or a long line of gel. Bait will dry up quickly if used on porous surfaces such as paper, concrete, or cardboard. Use a less porous surface such as bait plate stations, if needed. Do not use bait in the same areas as residual repellent sprays or where there may be residue from harsh cleaning products. Do not spray products on top of bait, as this may cause the bait to be less palatable. Avoid bait placements in areas exposed to air currents, such as in front of vents, as this will cause the bait to dry out more quickly. It is always recommended to use a protein bait, such as Maxforce Complete Granular Bait, in conjunction with a sweet bait such as Maxforce FC Ant Bait Gel. Within 24 hours, no ants! I had small black ants all over my kitchen counters. I put a smear of honey and peanut butter on foil in 2 corners of the counter that had the most ants. This would serve 2 purposes. It would tell me if the ants were going after protein (peanut butter) or carbohydrates (sugar), and it would cause the ants to create a trail. By creating a trail, I would know where they were coming from, and they would eat what was on the foil and not be all over my counter tops. I put the Maxforce FC Ant Bait Gel next to the honey (they were not attracted to the peanut butter), and within 24 hours, no ants! MaxForce FC Ant Bait Gel got rid of the tiny black ants that have plagued us for years! We tried every one of the products available from Lowes and The Home Depot - nothing worked, not even temporarily. We didn't want exterminators spraying the whole house, and they would only guarantee their treatment for a short time. MaxForce knocked them out within a day. I only had to use a tiny bit of it. I can retreat for years with just one box. Great stuff, thanks! 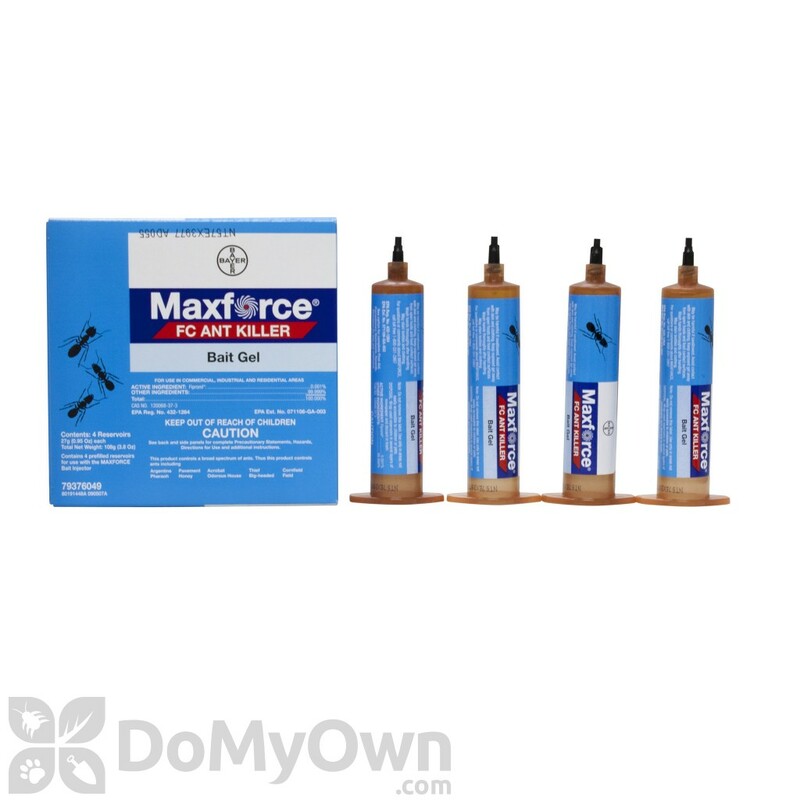 I bought the combo MaxForce FC Ant Bait Gel and Advance ant bait products because of the good reviews and we had a carpenter ant problem that returned every summer. Other products were only somewhat effective at knocking down the population that would come into the house. After doing some detective work at night, I found the main nest in a large tree with a split in the trunk. I applied both products to the main nest and where they were coming into the house. The ants did not seem to be attracted to the Advance but were drawn like flies to the MaxForce. Apparently, carpenter ants go through cycles of taste preferences so I guess they are currently feeding on sweets. Within a couple of days, I started seeing hundreds of ants keeling over along the trail between the tree and the house. I should have ordered this stuff a few years ago instead of trying the more generally available products at the home centers. I have tried everything under the sun (including Maxforce bait stations) to combat little black ants with only marginal success. With Maxforce FC Ant Bait Gel, however, the results were almost immediate, and more significant, long lasting. The little beggars swarm to it as soon as I put it down, and within a day or two they disappear completely. If you hate these pests as much as I do, give this stuff a try. Maxforce FC Ant Bait Gel is the real deal. I had what I believe were pharaoh ants. The gel and bait combo (Maxforce ant bait stations) wiped them out in about a week. Just follow the directions and recommendations and you'll be fine. What is the shelf life of Maxforce FC Ant Bait Gel? I am using some of this Maxforce FC Ant Bait Gel. I was given about a year or a year and a half ago. I am wondering if it is still powerful and does it expire? The Maxforce line of Roach and Ant Gels can be stored for up to two years at room temperature if they are unopened. Once the Maxforce FC Ant Bait Gel is opened, it needs to be used within 1 year. After 1 year, the gel will become stale and ineffective. What ingredients are in the MaxForce FC Ant Bait Gel? Many of the MaxForce products, including the MaxForce FC Ant Gel, use Fipronil as the active ingredient. Fipronil is a very safe, highly effective active ingredient used in many of our best selling products on our website. Is Maxforce Fc Ant Bait Gel safe around Cats and Dogs? When used as directed on the product label Maxforce FC Ant bait should not pose any problems for your pets. You should apply small dabs of gel directly into cracks and crevices that are inaccessible to your animals. We have what I think are pavement ants, very dark color and about 1/8 in. long. For complete ant control we would recommend a 2 part treatment plan. The first is to apply both a sugar based bait like Maxforce FC Ant Bait Gel along with a protein based bait like Advance 375A Select Ant Bait Granules inside where ant activity is most prevelant. It is very important to use protein and sugar baits because ants are moody eaters and will forage after a specific nutrient based on what they are lacking nutritionally. If you only use one or the other then bait acceptance may take longer than normal because you would have to wait for their dietary requirements to change. Secondly, we recommend performing an outdoor perimeter treatment with a non repellant like Termidor. Chances are that the ants in your house actually have their nest outside where they travel back and forth for food and water. So, since they live outside, it makes sense to control them there. Termidor SC can be applied above ground to the exterior foundation walls of your house, creating a treated area of protection for excellent ant control. Termidor is unique because ants not directly exposed to the Termidor-treated area will be controlled as they come into contact with affected ants. This Transfer Effect means you'll see its effects on ants in one to three days, and most species will be controlled within the first week following the treatment. 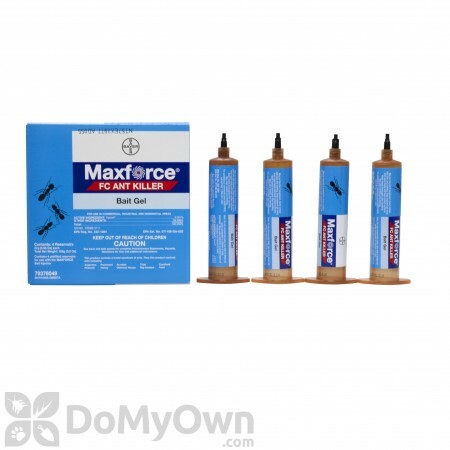 What is the difference between Maxforce FC Ant Bait Gel and Maxforce Carpenter Ant Bait Gel? I see they have the same active ingredient & active ingredient percentage. Maxforce Carpenter Ant Bait Gel has a different bait matrix specifically targeting that species. The Maxforce FC Ant Bait Gel is great for other ant species. They do carry the same active ingredient Fipronil (which is also the same percentage). It is the attractants that are different.